"Finding a way to show how the Beast fell under the curse provoked a memorable disagreement. Howard [Ashman] envisioned the prologue as a fully animated sequence in which the audience would see a seven-year-old prince rudely refuse to give shelter to an old woman during a storm. Revealing herself to be a beautiful enchantress, the woman would chase the boy through the castle hurling bolts of magic that would turn the servants into objects. Eventually her spell would change the prince into the Beast boy, who would press his face against one of the castle windows screaming, "Come back! Come back!" "
Fortunately, Gary Trousdale and Kirk Wise, the directors, hated this idea. Why would you ever punish a seven year old with a curse that could only be broken by falling in love? The above suggestion would shift the blame for the curse away from the prince's selfishness and to the over-zealous enchantress. This curse would be completely random, as opposed to the Villeneuve version, which has a spiteful evil fairy cursing an innocent prince, or the way the Disney version turned out-a hopelessly selfish prince who needed a huge wake up call. 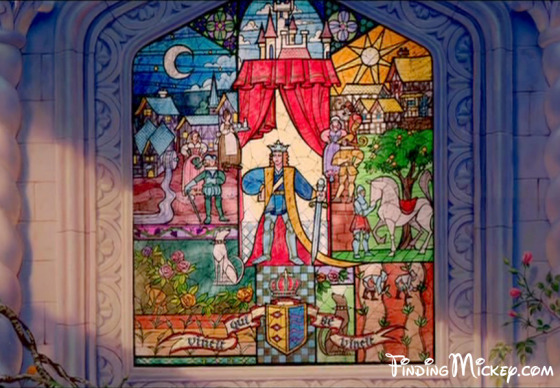 I like the stained glass opening-it sets up the tale in a unique but visually beautiful way. The inscription on the bottom of the stained glass above, "vincit qui se vincit," translates as "He conquers who conquers himself."